In an effort to implement national skills certification programmes, as at March 2006, a total of 1,100 training institutions have been approved as MLVK Accredited Centres. The skills training programmes that have been accredited amounted to 5,806, which encompass a diverse range of fields and levels of skills that have already been covered by NOSS. The adoption of a new 5-level National Skills Qualification Framework (which is the Malaysian Skills Certification Level 1 – 5) in replacement of the prevailing 3-tiered Skills Certification System, or Sijil Kecekapan Ketukangan, SKK (which comprises Basic, Intermediate and Advanced) to address the shortfall of vocational and skills training development in Malaysia. 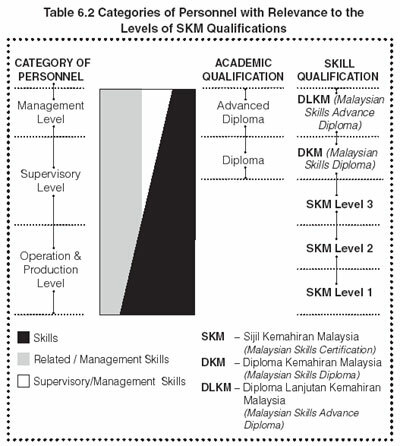 Through the introduction of this new certification structure the Sijil Kemahiran Malaysia (SKM) Level 1 replaces, with no conditions, the SKK Basic Level; the SKM Level 2 replaces, with no conditions, the SKK Intermediate Level; and SKM Level 3 that replaces the Advanced Level, with the additional requirement of Supervisory Skills. Meanwhile, in October 1995, MLVK decided to acknowledge SKM Level 4 as Malaysian Skills Diploma and SKM Level 5 as Malaysian Skills Advanced Diploma. The introduction of a new Accreditation Approach to replace the trade testing system. Under a pilot project in 1993, MLVK selected and appointed 9 public training institutions as the pioneer group of Accredited Centres that covered a total of 20 accredited training programmes. The rapid expansion of the SKM in Malaysia since its introduction and launch in 1993 reached its peak by the year 2002, in which 1,809 Accredited Centres run a total of 6,813 accredited programmes. To reinforce the adoption of Competency-Based Education/ Learning (CBE/L) principles in the vocational training system in Malaysia. This approach basically involves the shifting of emphasis from an instructor-centred approach towards a trainee-centred approach, entailing the identification of distinct and verifiable competencies that are actually required in the working world, apart from focusing on actual performances in the assessment of these competencies. The competencies to be achieved in training for a particular job are identified by expert workers and practitioners, which are clearly defined and spelt out in NOSS. The competencies are clustered around modules, which are called “duties” in NOSS, so as to enable training as well as assessment and certification to be more fl exibly-packaged and undertaken. The assessment of competencies places emphasis on actual performance that are based on specified criteria. Self-paced learning that is increasingly becoming the norm in training, where trainees would progress at their own pace rather than be dictated by the instructor or group. Self-directed learning that is also increasingly becoming a key feature of training, where trainees would take greater responsibilities for their own learning process while instructors, would on the other hand, function as merely facilitators or resource persons. The diagram displayed below shows the concepts/principles of Competency-Based Education/Leaning (CBE/L) Model for skills training in Malaysia. PIACC is formed by MLVK to create and maintain a forum for all major public training agencies so as to discuss issues and problems encountered in the execution of public skills training programmes. These issues comprise training curriculum, teaching manpower, trainees and training facilities. The SDP for instructors and vocational officers is one of the programmes being carried to enhance the skills and knowledge of teaching manpower/vocational training officers, as well as to increase exposure to new technologies and the latest training system that is in line with the advancement of industries. This training programme is fully funded/sponsored by the Public Service Department. Ensures that the skills training system, and MLVK products like the SKM certification and NOSS are widely-known to the public so as to encourage more participants to take up skills training. Among the promotional events being conducted are the organising of national seminars and the production of printed materials and articles of MLVK, other than participating and organising exhibitions and training expos. The SKM certification can be obtained through MLVK Accredited Centres and Programmes. Trainees who have successfully undergone accredited training programmes at MLVK Accredited Centres and have met the stipulated assessment and verification requirements will be awarded with the SKM. The National Skills Testing is another procedure for the awarding of SKM, which is conducted for specific fields in only a few approved testing centres. At present, this system is only executed for the SKM certification in the field of “Non-Destructive Testing (NDT)”, while for the other fields, certification is done through the Accreditation System. Candidates who comprise experienced and skilled personnel, can be awarded the SKM upon successfully meeting the stipulated assessment and verification requirements. c) Creating an awareness and understanding about the importance of skills training for the development of the nation. Recognition for the other skills qualifications, which are awarded by Government agency, employer and industry as well as international agencies and organisations. A certification structure which comprises a 5-level National Skills Qualification Framework (which is the Malaysian Skills Certification Level (MSC) Level 1 to 5 or in Bahasa Melayu - Sijil Kemahiran Malaysia (SKM) Tahap 1 ke 5 ) i.e. SKM Level 1, SKM Level 2 and SKM Level 3 for basic skill levels, while SKM Level 4 as Malaysian Skills Diploma and SKM Level 5 as Malaysian Skills Advanced Diploma levels. Accreditation Approach instead of the trade testing system, to approve a particular organisation (eg training providers, employers) as an Accredited Centre so as to enable the Centre to undertake training and skill assessment leading to the award of SKM qualification to the trainees. This SKM qualification framework (i.e. SKM Level 1 to 5) was introduced in 1993. The SKM Framework is conducted and operated based on National Occupational Skills Standards (NOSS), where each candidate would be assessed on whether they have actually fulfilled the needs of NOSS before being approved and awarded with the SKM qualification. This approach would basically help to supply more skilled and trained workers with the necessary qualifications to increase the competitiveness of the local industry in the world market. Apart from this, the SKM Framework also provides candidates with another qualification path and career development opportunity that has been established in line with the academic qualification structure. In other words, this means that the double qualification structure is based on two types of qualifications, namely the academic qualification and the skills qualification that are available in this country today. The emergence of this new skills qualification structure has opened up a whole new set of opportunities for all school leavers, or those who do not have the intention of furthering their studies at educational institutions. In addition, it also caters to workers who have no qualifications to show despite having years of working experience. SKM Level 2 • Competent in performing a significant range of varied work activities that are being performed in a variety of contexts. SKM Level 3 • Requires competency in performing a broad range of varied work activities that are preformed in a variety of contexts, most of which are complex and non-routine. • There is also a considerable amount of responsibility and autonomy, while control and guidance of others is also often required. Kemahiran Malaysia, DKM (Malaysian Skills Diploma) • Candidates are required to be competent in performing a broad range of complex technical or professional work activities that are performed in a wide variety of contexts, and with a substantial degree of personal responsibility and autonomy. • In addition, the responsibility for the work of others and allocation of resources is very often present. (Malaysian Skills Advanced Diploma) • Participants would need to possess the necessary competence so as to be able to apply a significant range of fundamental principles and complex techniques across a wide and often unpredictable variety of contexts. The diagram below denotes the SKM Framework , which is sorted as according to the Categories of Personnel, the Academic Qualifications, and Skills Qualification Levels (from SKM Level 1 to SKM Level 3, DKM and DLKM). According to the National Skills Certification Programme undertaken by MLVK in Malaysia, accreditation is a procedure where MLVK would approve a particular organisation as an Accredited Centre, so as to enable the organisation to undertake training and assessment in specific skills programmes at different skill levels that ultimately leads to the award of the Malaysian Skill Certificates (MSC/SKM). the quality of the Malaysian Skills Certificates for specific jobs that are covered by the NOSS. Upon the attainment of accreditation, the respective Accredited Centre can offer training courses to all interested individuals concerned, and conduct assessments for SKM certification purpose. Accreditation is granted for a duration period of 3 years, after which the Accredited Centre is required to submit their application for the renewal of accreditation within a period of 3 months before the accreditation expires. Re-accreditation is usually extended for another time period of 3 years. As at June 2006, there are a total of 1,123 training institutions that have been approved as MLVK Accredited Centres and 6,047 skills training programmes have been accredited. In order to maintain the credibility and continued acceptance of the Malaysian Skills Certificates, the National Skills Certification Programme adopts a stringent procedure of quality control and course assurance, where three levels of key personnel are involved, namely i) The Assessors, ii) The Internal Verifiers (Pegawai Pengesah Dalaman – PPD), and iii) The External Verifiers (Pegawai Pengesah Luaran - PPL). The diagram below depicts the overall structure of quality assurance as practised in the National Skills Certification Programme. The assessors (PP) and internal verifiers (PPD) are appointed by Accredited Centres from amongst its trainers and training officers who have been accredited by MLVK through numerous special Induction Officers. They would perform in-house assessment as well as internal verification based on documentation and procedures that have been stipulated by MLVK. On the other hand, the external verifiers (PPL) are officials accredited and appointed by MLVK to ensure full conformity of the assessment and internal verification carried out at Accredited Centres to the specified requirements. These external verifiers would generally make 3 or 4 verification visits on an annual basis to the Accredited Centres that they have been assigned to, during which he/she will check the portfolios of candidates and endorse applications for the award of the SKM. Apart from this, an external verifier would also assess on whether the Centre has already met all accreditation requirements in terms of training, assessment and quality control, other than recommending to the MLVK as to whether accreditation at the respective Centre should be continued or reviewed. Besides the SKM award, the Statement of Achievement (or Penyata Pencapaian/PC) has been introduced for the first time in the country. PCs are awarded to individuals when they are deemed to be competent in a particular unit of competence (at the level of duties in each NOSS). Each of these statements represents credit that can be accumulated until they suffice for the award of the SKM certification. In addition, these credits may also be transferable across different job areas, particularly where the generic skills are involved, which would hence enable the operation of a system of credit accumulation and transfer. Regarded as a useful tool in increasing the quality of work of employees, NOSS is drawn up by expert workers and practitioners who are appointed by MLVK, where they would be responsible in identifying the competencies that are required in the respective jobs. It is being used as a basis by skills training institutions to make changes to teaching materials i.e. the syllabus of the lessons, contents outline and guideline as well as the skills training modules. For the purpose of skills certification, NOSS is used as the main criteria when determining the level of competency that a trainee is required to obtain. For employment purpose meanwhile, NOSS can also be used for various intentions such as hiring/recruiting employees, analysing training needs, as well as assessing the performance of staff. With NOSS being used as the basis for the delivery of training programmes, training providers can be assured that their graduates would actually meet the competency requirements as according to the expectations set by the Malaysian industry. Besides this, NOSS also plays imperative significance in the many contexts of the working world, such as benchmark setting in assessing the workers’ performance, as well as determining the work tasks for employees and the different career paths that a respective job can lead one to. 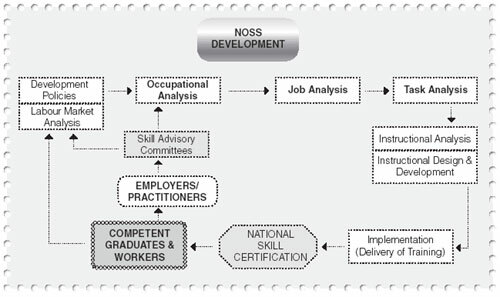 Therefore, NOSS can be regarded as a standard measurement for skills and job competency in Malaysia. Meanwhile, an approach called the Accreditation of Prior Achievement (APA) was introduced by MLVK as part of the system in 1996. It aims to give due recognition to a certain skills level already achieved by experienced workers and serves to ultimately highlight the important role that skilled workers play in the society today. In addition, this approach also gives value to previously acquired competencies, which include working experiences and learning activities of the nation’s skilled workers, so as to enable them to have the opportunity to obtain the SKM certification. Possess valid and sufficient evidences such as work experiences, education & training, life experiences and other relevant achievements. If the applicant possesses the valid and sufficient evidences based on the above said Step 3, then he/she can submit the application in order to be approved as a candidate. Once the applicant receives an official notice/receipt informing him/her that he/she has already been approved as a candidate, the candidate will then undergo counselling and portfolio development sessions, which are being guided by the appointed assessor. The candidate would next be assessed through the stipulated assessment process, followed by verification, and if deemed successful, he/she will be awarded SKM/ PC certificate. The table below shows the number of MLVK accredited programmes being offered for each of the skills qualifications Level 1 – 5. The table below shows the total number of accredited centres and programmes, which are arranged according to the various categories such as government ministries, agencies and private sector as at June 2004. The introduction of the National Skills Certification System in 1993 by MLVK and the soon to be implemented National Skills Development Act by the Ministry of Human Resources as well as the Malaysian Qualification Framework by the Ministry of Higher Education will serve to restructure and streamline the national vocational and skills training in the country towards meeting the demands of today’s job tasks more effectively. Its introduction is indeed timely, given the high priority that it places on the area of human resource development. With the emphasis towards preparing trained and qualified skilled workforce to support the country’s economic development, therefore, the more flexible framework of national skills recognition and qualifications is necessary to promote a conducive training culture for the personal motivation of skilled workers, which would hence lead to the overall upgrading of competencies amongst the country’s skilled workforce. The implementation of this National Skills Certification System is also motivated by the recognition that it is ultimately the country’s human resources or its skilled workforce in particular, which would be instrumental in helping the nation achieve its ambition of being a fully-developed and industrialised nation by the year 2020. Last but not least, it also aims to change the negative societal perception and low image usually associated with skill-based careers, as these career paths are assumed to be only for those who are deemed to have failed academically. Therefore, it seeks to give greater recognition to the skilled workforce in the country, so as to commensurate with its important role in the Malaysian society today. This write-up is edited and revised by Mr. Pang Chau Leong, Deputy Director-General of MLVK.